Italian wooden writing desk in Art Deco styleItalian writing desk from the mid-20th century. Particularly shaped furniture, finished for the center in carved mahogany, tuja burl, beech and fruitwood. Desk with three front drawers with wooden top of excellent service. Furniture equipped with a foot rest in the inner part (see photo). Hard-to-find and rare beauty writing desk, in Art Deco style. It presents some small lack of veneer and some signs of wear, overall in good state of conservation. Italian still life painting from 19th centuryItalian painting from the late 19th century. Oil painting on canvas, first canvas, depicting still life with decorative elements, fruit and bush meat. Framework of excellent pictorial quality in impressionist style with frame in carved and gilded wood and plaster of beautiful decoration. Painting for antique dealers and collectors, missing signature. Complete with protective glass, it is in a good state of conservation. Sight size: H 74.5 x W 44.5 cm. Italian tallboy in lacquered and gilded wood in Louis XVI style20th century Italian tallboy. Louis XVI style furniture in carved, lacquered and gilded (bronze color) wood of good quality. Tallboy with seven drawers of excellent capacity and service, ideal for a bedroom or studio. Furniture adorned with gilded and chiseled brass knobs. Tallboy of excellent proportions with some minor drops of color, overall in a good state of conservation. Italian lacquered, painted and gilded dresserItalian dresser from the mid-20th century. Furniture in carved, lacquered, gilded and hand painted wood of excellent quality. Chest of drawers with two drawers of good capacity and service with a wooden top adorned with a central painting (see photo). High-impact bedroom or living room furniture of beautiful decoration. It presents some small drops of color, on the whole in good state of conservation. French coffee table with onyx topLiving room coffee table from 20th century. Round table supported by four legs in finely chiseled and gilt brass with top in onyx in good condition. French furniture of high proportion that can be easily placed into different parts of the house, ideal for a living room. Table in good condition, with some small signs of the time. Italian mirror in gilded woodGreat Italian mirror from the 20th century. Furniture in richly carved and gilded wood of excellent quality. Mirror of great size and impact that can be combined with a chest of drawers or a bureau but it can also be placed alone into a piece of furniture. Furniture adorned with a moulding with golden shell and curled feet. In good condition with some small signs. Italian lacquered, painted and gilded wardrobe20th century Italian wardorbe. Furniture in carved, lacquered, gilded and hand painted wood with very pleasant floral decorations. Entrance armoire with two doors, equipped with an internal coat hanger and a good service hatbox. Particularly proportioned cabinet supported by four legs with curled feet, to be fixed to the wall for perfect stability. Missing key, it shows some small signs of wear, overall in a good state of conservation. Italian golden coffee table with onyx topItalian coffee table in carved and golden wood and plaster of beautiful decoration. Top in onyx of good measure and service. Living room table by pleasant decor. It presents some minor gilding drops on the whole in good state of conservation. Italian painting Venus and Mars oil on canvas20th century Italian painting. Oil painting on canvas depicting a copy of the famous painting by Rubens Venus and Mars. Framework of great measure and impact for antique dealers and interior decorators, ideal for a living room or studio. Guillauche wooden frame with some signs of time, of beautiful decoration. Framework in good condition with some small signs of wear. Sight size: H 119 x W 128 cm. French lacquered and painted chinoiserie mirror20th century French chinoiserie mirror. Furniture in carved, lacquered and painted chinoiserie wood of beautiful line and pleasant decor. Vertical mirror that can be easily placed in different parts of the house, for antique dealers and interior designers. It presents some small drops of color, on the whole in good state of conservation. French filing cabinet in oakFrench filing cabinet from the mid-20th century. Oak furniture with linings and internal shelves in plywood for decorators. Filing cabinet with several internal shelves, some of which are missing (see photo), of good service. Roller shutter complete with a working key and front handle. In good condition with some small signs of the time. French side table in inlaid wood20th century French side table. Beautiful line furniture of pleasant decor inlaid in woods of rosewood, maple, mahogany and fruitwood with decorations in gilded and chiseled brass and bronze. Night stand finished for the center equipped with a front drawer and two wooden tops in character, of discrete service. It can be easily placed in different parts of the house, it is in a good state of conservation. French tray in lacquered and painted chinoiserie metalFrench tray from the late 19th century / early 20th century. Object in lacquered and hand-painted metal with fascinating chinoiserie decorations. Beautiful oval tray for antique dealers and collectors. It presents several small drops of color and signs of wear, in beautiful patina. Overall in a fair conservative state. Pair of Italian angels sculptures in gilded bronzePair of Italian sculptures / bookends from the late 19th / early 20th century. Objects in finely chiselled and gilded bronze fixed on a marble base. Sculptures depicting winged angels with flowers of great pleasure. 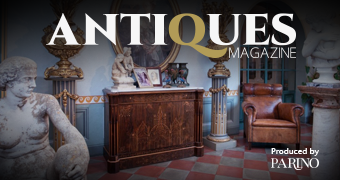 Small measures objects, for antique dealers and collectors, in good state of conservation and in beautiful patina. Measurements: H 21 x W 8 x D 12 cm - H 19 x W 8 x D 11 cm. French seascape painting signed L. Henry from 19th centuryFrench painting from late 19th century. Oil painting on canvas depicting a seascape with boats and characters in Calais (see writing on the lower left) signed lower right (L. Henry). Framework of pleasant decor with carved wooden frame from 20th century. Painting for antique dealers and collectors in good state of conservation with some drops of color (see photo). Sight size: H 45 x W 54 cm. Italian sofa in gilded wood and blue velvet from 19th centuryItalian sofa from the late 19th century. High quality carved and gilded wooden furniture covered in velvet with some signs of wear (see photo). Beautiful line sofa of pleasant decor ideal to be included in a living room or studio. Furniture that is part of a living room set (see photo and request the block price if available). In good condition with some signs of the time. Seat height 45 cm.